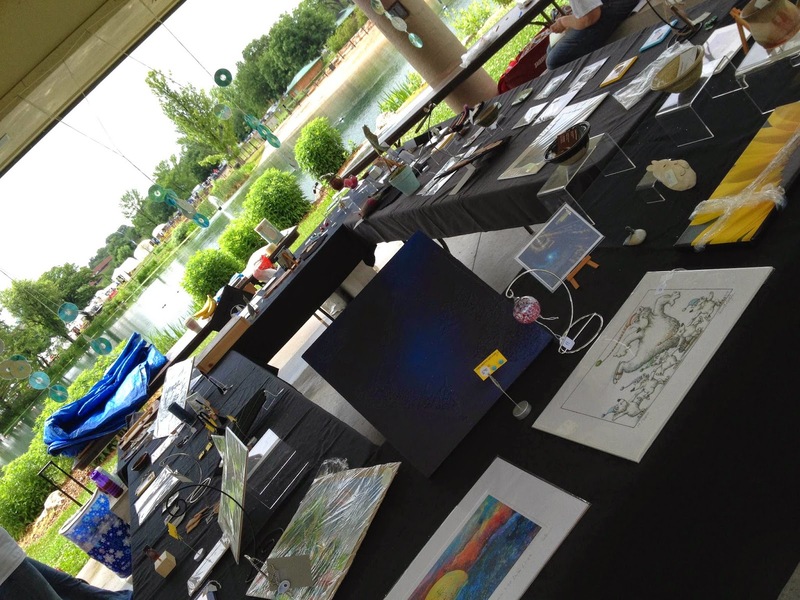 Despite the rain today Art in the Park in Columbia, Missouri was a huge success, or at least by measure. I thought the rain had quit or blew by us, but just as we stepped off the shuttle bus the clouds opened up and it poured. Thankfully, we had stopped by the store and snagged some cheap ponchos and was able to enjoy an afternoon of art. Art in the Park was more than I expected, I knew it would be big, but was not sure how big it would be. 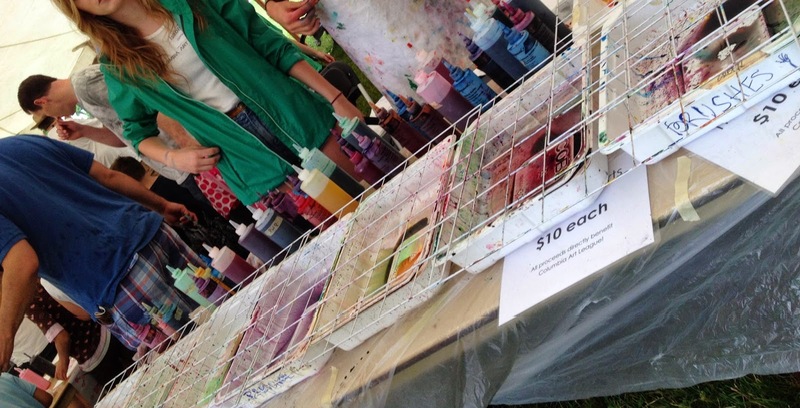 While they call this an art festival, it is more than just an art festival - there is a huge variety of art, activities, and vendors, you will find something for everyone! 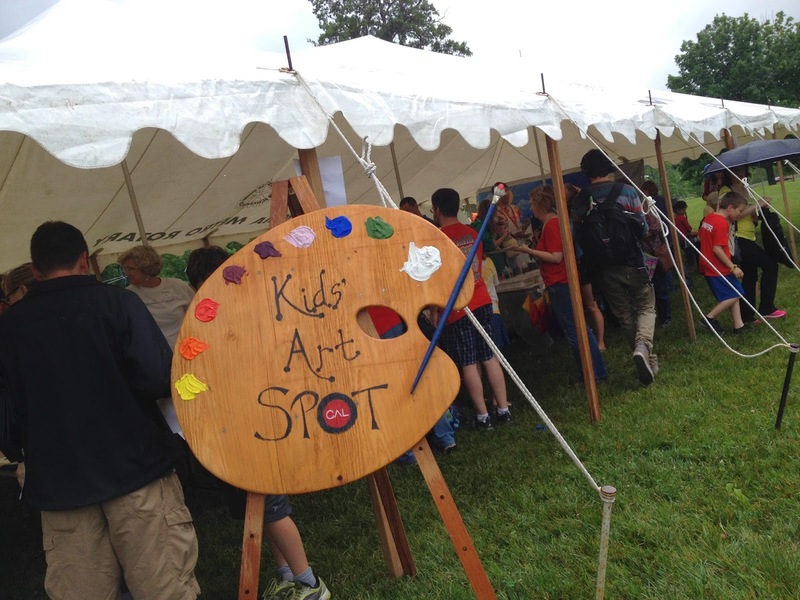 Now contrary to belief, Art is not just for adults, this festival is very much geared towards families - all the way down to location, activities, and food. Across the park there is a special kids area, that includes kid friendly do it yourself art, puppet shows, balloon artists, and much more- by the way parents this tent was the most crowded, I would say it was a favorite. Do you have a young collector or a child that is interested in collecting art? The Young Collectors Tent is a must stop then, I found myself a bit jealous of the young collectors as I would have loved a chance at this. In the Young Collectors area - children ages 5-14 donate $5 to enter then they get to choose one piece of artwork to keep. The art has been donated by other artist in the park, and all the proceeds go to fund the educational programs the Columbia Art League offers. - This is obviously a win win situation. Now off to lunch - just hit the food trucks, my biggest fear upon arriving at the Art in the Park was "what if I do not find anything good to eat?" - I should have known from last visit to Columbia, Missouri that the food would be good! 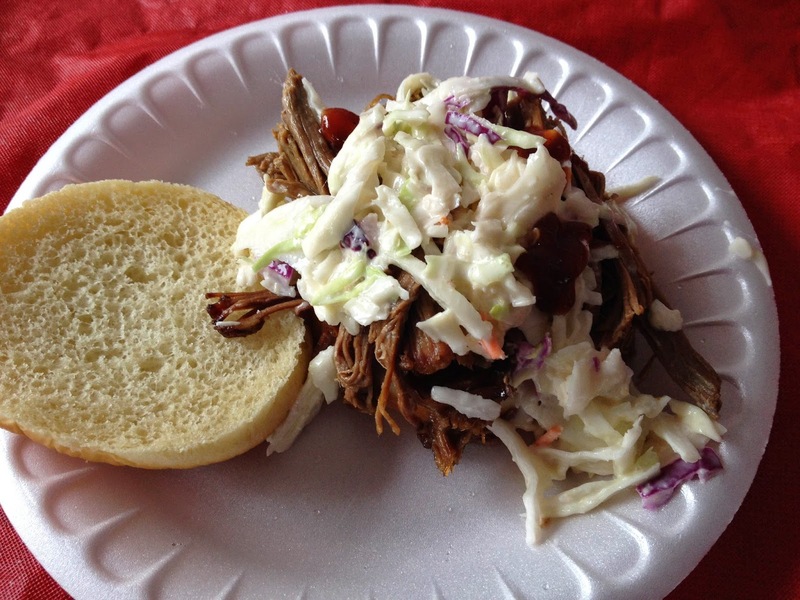 We located Smokin' Chicks BBQ and I devoured (licked the plate clean) a Brisket Sandwich with Cole Slaw on top of it. Yes it was as good as it looks! Drinks were easy - yes all the local food trucks offered anything from lemonade to soda, but the coolest drink table is offered by the Art League. For just $2 you got a refillable plastic cup of flavored water, and the you got free refills all weekend long. I suspect these will be a huge hit on Sunday as it is suppose to be warm and a bit more sunny. Art in the Park is FREE, and they offer a FREE shuttle so that you can save your legs for walking around the park. The event continues tomorrow (Sunday, June 8th, 2014) from 10 - 4. It appears the weather will be better, so you may not need the rain slicker and gear that I did. I do suggest walking shoes, a stroller if you have a little one, and a bag to carry all your great buys!